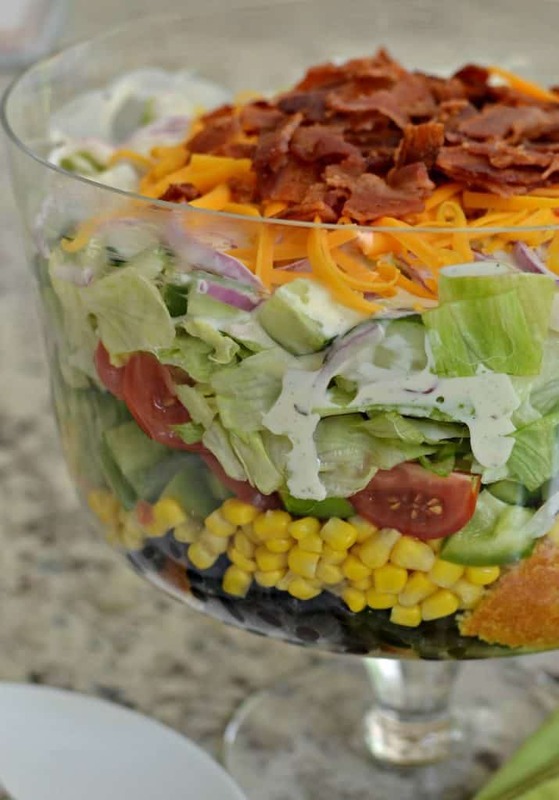 Southern Cornbread Salad is a delicious combination of cornbread, black beans, corn, tomatoes, green peppers, cucumber, red onions, bacon and cheddar. It all comes together quickly and easily making it one of our favorite go to salads. Summer season isn’t even quite here and we are looking at record highs already. Are you ready for the heat? With the summer heat comes lots of great salad recipes. This Cornbread Salad is quick to prepare and pretty enough for company. 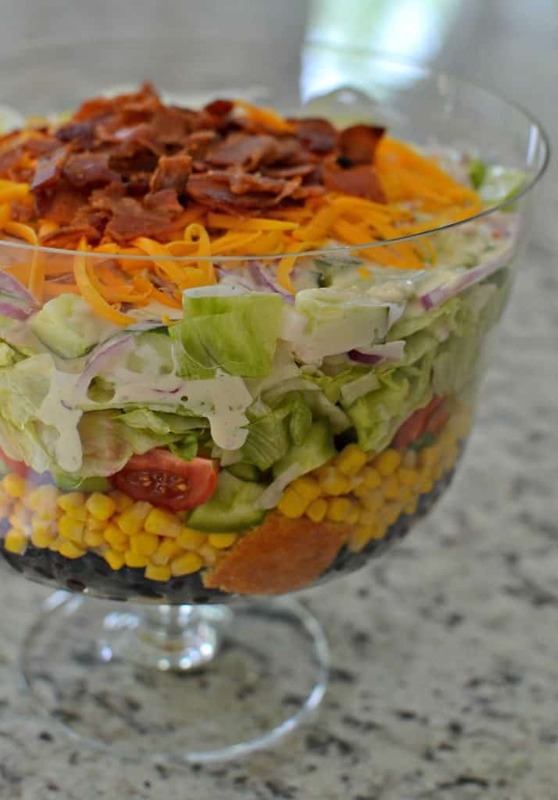 You can assemble this layered salad in a large clear bowl or even a clear rectangular baking dish. The colors on this salad pop and make this salad just so perfect for a small dinner party. In a hurry bake the cornbread a day or two in advance. Hubby and I just love salads. We eat salad for dinner at least twice a week during the spring and summer. Here are several of our favorite salads. Some of them are mine and some are from some of my favorite bloggers. 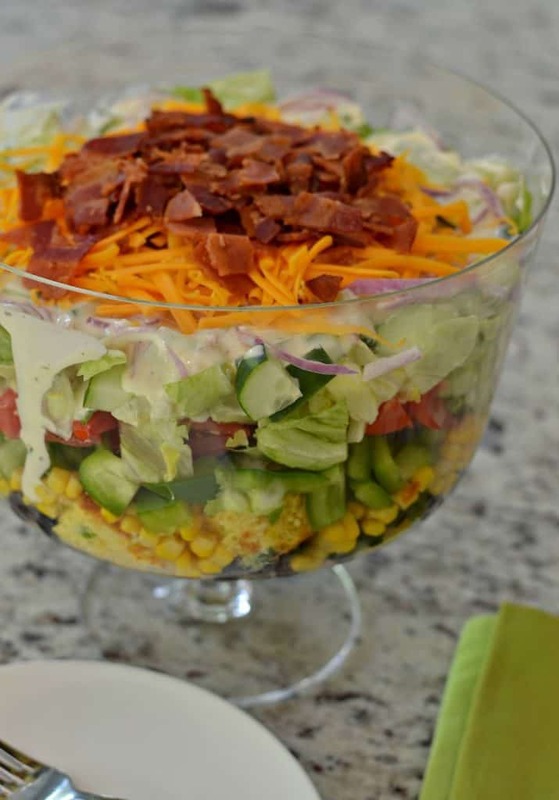 This delectable Southern Cornbread Salad takes full advantage of cornbread mix and your favorite bottled ranch dressing. I do throw a couple of add ins for the cornbread and the salad dressing to jazz them up a bit. It can be a complete meal or a nice complement to some barbecued ribs and baked beans. You can prepare this salad up to several hours in advance. I did use iceberg because of the lettuce scare lately but you can use romaine as well. You just need a good sturdy lettuce. Put the ingredients for this Southern Cornbread Salad on your shopping list today. You are going to love it!! Preheat oven to 400 degrees and spray 8 x 8 inch pan with nonstick baking spray. In medium bowl stir together corn muffin mix, egg, buttermilk and jalapeno. Bake 15-20 minutes or until golden brown. Cool and slice into cubes. 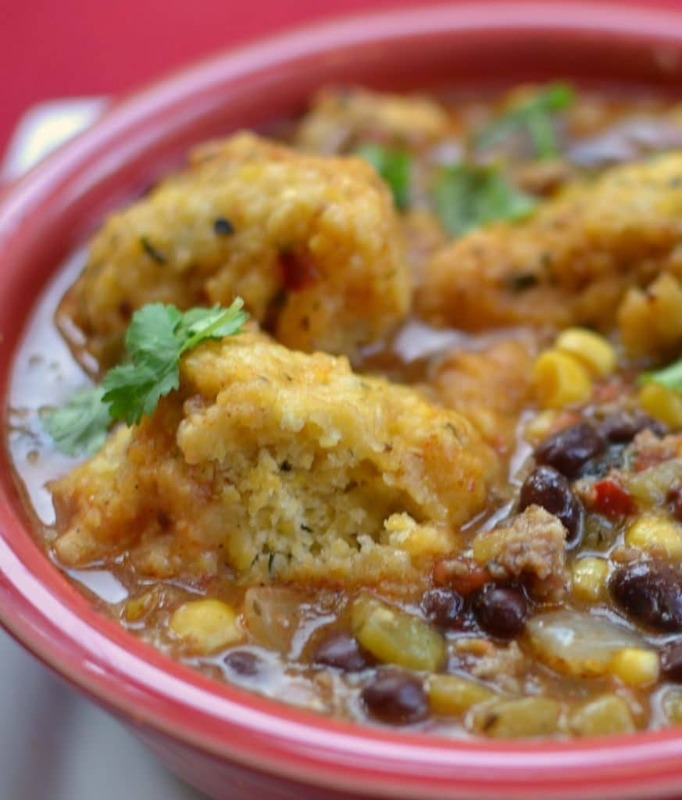 In large glass bowl or glass casserole dish layer cornbread, beans, corn, green pepper, tomatoes, cucumber, red onion and iceberg. In small bowl mix together ranch and mayo. Spread over the top of the salad. Top with cheddar and bacon. Cover with wrap and place in refrigerator for 1-2 hours. 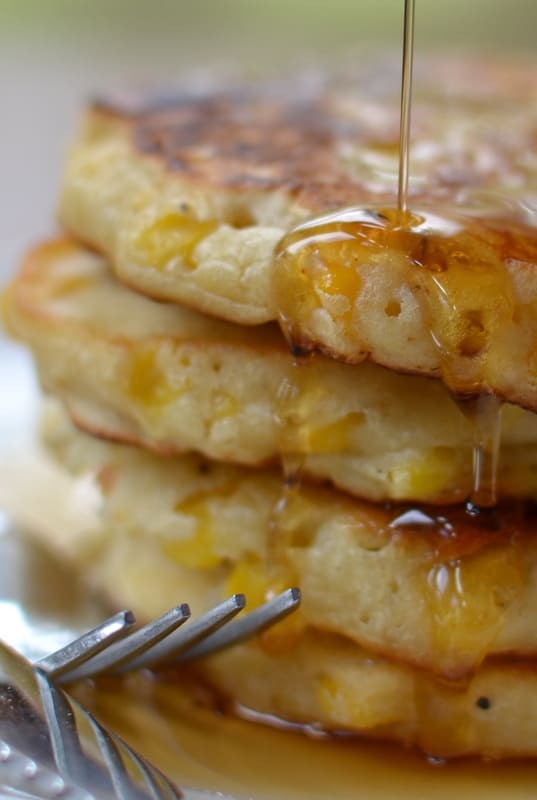 Other cornbread recipes you will love! !